This article is about the social media phenomenon. For the TV episode, see Nevertheless, She Persisted (Supergirl). "Nevertheless, she persisted" is an expression adopted by the feminist movement, especially in the United States. It became popular in 2017 after the United States Senate voted to silence Senator Elizabeth Warren's objections to confirmation of Senator Jeff Sessions as U.S. Attorney General. Senate Majority Leader Mitch McConnell uttered this sentence during comments following the vote in an effort to defend the silencing. The expression went viral as feminists posted it with hashtag references to other women. Conservative critics objected that comparisons between Warren and other female political activists were inappropriate. Its meaning expanded to refer to women's persistence in breaking barriers, despite being silenced or ignored. On February 7, 2017, the U.S. Senate debated confirmation of Senator Jeff Sessions of Alabama to become Attorney General. Senator Elizabeth Warren of Massachusetts spoke against confirmation, criticizing his record on civil rights. Senator Warren quoted a statement from 1986 by former Senator Ted Kennedy regarding Senator Sessions' nomination to federal court judge, "'He is, I believe, a disgrace to the Justice Department, and he should withdraw his nomination and resign his position.'" Senator Warren said she "will stand with Senator Kennedy, and, like he did, I will cast my vote against the nomination of Senator Sessions." Civil rights leaders, including my husband and Albert Turner, have fought long and hard to achieve free and unfettered access to the ballot box. Mr. SESSIONS has used the awesome power of his office to chill the free exercise of the vote by black citizens in the district he now seeks to serve as a federal judge. This simply cannot be allowed to happen. Mr. SESSIONS' conduct as U.S. Attorney, from his politically-motivated voting fraud prosecutions to his indifference toward criminal violations of civil rights laws, indicates that he lacks the temperament, fairness and judgment to be a federal judge. While Senator Warren was reading the letter from Mrs. King, Presiding Senate Chair Steve Daines of Montana interrupted her, reminding her of Senate Rule XIX, which prohibits ascribing "to another senator or to other senators any conduct or motive unworthy or unbecoming a senator." Senator Warren stated that she had only said that former Senator Kennedy had called Senator Sessions a disgrace, and she asked whether reading King's letter that had been admitted into the Senate Record in 1986 was a violation of Senate Rules. Presiding Senate Chair Daines again quoted Rule XIX. Senator Warren asked to continue reading Mrs. King's letter, and Presiding Senate Chair Daines allowed her to do so. While Senator Warren continued reading the letter, Senate Majority Leader Mitch McConnell of Kentucky interrupted, saying, "The senator has impugned the motives and conduct of our colleague from Alabama, as warned by the chair." Senator McConnell objected to a line from Ms. King's letter, "Mr. Sessions has used the awesome power of his office to chill the free exercise of the vote by black citizens", which Senator Warren had quoted prior to the warning. Senator Warren said she was "surprised that the words of Coretta Scott King are not suitable for debate in the United States Senate", and requested to continue. Senator Daines asked whether there was objection. Senator McConnell objected, and Senator Daines called for a vote saying, "The senator will take her seat", preventing Senator Warren from continuing. The Senate voted to sustain McConnell's objection along party lines, 49–43, silencing Warren for the duration of the Sessions confirmation hearings. Thirty hours remained in the hearings, and Democrats objected to Senator Warren's silencing. Senator Jeff Merkley of Oregon subsequently read the letter from Coretta Scott King without objection. Senator Cory Booker of New Jersey pointed out that the letter was already in the 1986 Congressional Record. Senator Warren was giving a lengthy speech. She had appeared to violate the rule. She was warned. She was given an explanation. Nevertheless, she persisted. If the Republican senators had intended to minimize Warren's message, the decision backfired—severely. Her supporters immediately seized upon McConnell's line—giving Warren a far bigger megaphone than if they had simply let her continue speaking in what had been a mostly empty chamber, some pointed out. CNN reported, "For Warren's supporters, it was a textbook case of mansplaining followed by males silencing a woman". On National Public Radio's All Things Considered, Scott Detrow said that "Nevertheless, she persisted" had become the new "nasty woman", which had become a rallying cry derived from Donald Trump's description of Hillary Clinton in 2016. 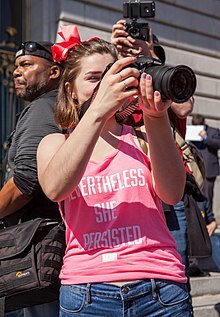 Megan Garber of The Atlantic wrote that "Nevertheless, she persisted" appeared on the internet next to "images not just of Warren and King, but also of Harriet Tubman, and Malala Yousafzai, and Beyoncé, and Emmeline Pankhurst, and Gabby Giffords, and Michelle Obama, and Hillary Clinton, and Princess Leia. It accompanied tags that celebrated #TheResistance." Hillary Clinton tweeted, "She was warned. She was given an explanation. Nevertheless, she persisted. So must we all." It also appeared on merchandise: Reebok produced tee shirts with the expression and gave the proceeds to the Women's March. Hoodies and mugs with the meme were also produced. Salon reported women getting tattoos of the three words, more than 100 women in Minneapolis alone. On June 7, 2017, Senator Warren tweeted support for Senator Kamala Harris using the "Nevertheless She Persisted" hashtag, after Harris was admonished for interrupting Deputy Attorney General Rod Rosenstein during a hearing. In 2018, the Women's History Month theme in the United States was "Nevertheless, She Persisted: Honoring Women Who Fight All Forms of Discrimination against Women", intentionally referring to the "Nevertheless, she persisted" remark by Mitch McConnell. Others were less favorably inclined toward the expression and its application to Warren. Charlotte Allen of The Weekly Standard suggested that #Shepersisted was yet another tactic in the marketing of Warren as a possible presidential candidate, describing it as "Red meat for Warren's supporters, who promptly cried sexism and compared her to Rosa Parks in her refusal to move to the back of the bus, and also to Marie Curie, who never gave up on her quest to discover radium. Within hours entrepreneurs were grinding out 'Nevertheless, she persisted' T-shirts in every size and color." The incident was also discussed in the context of Senator Warren's possible presidential candidacy by the National Review's David Harsanyi, who referred to Rule XIX as "an arbitrary, speech-inhibiting rule that should not be used". Stating "it was unlikely any persuadable voter would have even heard about Warren's grandstanding if it weren't for the kerfuffle", he suggested that the "fuss" (including popularity of the hashtags "#Shepersisted" and "#LetLizspeak") was indicative of a Democratic tendency to "rely heavily on the identity politics that have failed them for six years, if not longer." Tubman and Truth were enslaved and beaten, Anthony and Stanton were denied the right to vote, Parks was thrown in jail, and Yousafzai was shot in the brain. Warren stood in the U.S. Senate insisting that Sessions's "racism, sexism, and bigotry" are dangerous to American freedoms, a claim that is dubious at best. The idea that she has done anything even remotely comparable to these women is ludicrous at best. And at worst, it trivializes the courage of those in whose company it places Warren and makes a mockery of their contribution to democracy. Gretel Kaufman of The Christian Science Monitor noted that some Democrats used the hashtag #LetLizSpeak to call Senator McConnell's remarks sexist, and that video of Senator Warren reading the full letter was widely viewed on social media. Raising concerns that the incident was "an example of partisanship getting in the way of productive debate", Kaufman quoted Republican Senator Orrin Hatch of Utah, as saying that "All of us need to take stock and need to start thinking about the people on the other side of the aisle and need to start thinking about how we might bring each other together." Some observers posited non-political reasons for the meme's proliferation. According to Daniel Victor of The New York Times, "A broader theme—that women are too commonly shushed or ignored—emerged on social media." Victor also noted that "a man silencing a woman struck some as all too common", and "rang familiar with many women who had their own stories of being silenced." The Atlantic's Megan Garber wrote, "American culture tells women to be quiet—many ways they are reminded that they would really be so much more pleasing if they would just smile a little more, or talk a little less, or work a little harder to be pliant and agreeable." Further, she wrote, when Senator Warren was silenced, "many women, regardless of their politics or place ... felt that silencing, viscerally ... Because, regardless of their politics or place, those women have heard the same thing, or a version of it, many times before." Heidi Stevens of the Chicago Tribune commented, "Three little words that women can draw on for decades to come, when something needs to be said and, darn it, we plan to say it. When we're being talked over in meetings. When we're fighting to be heard in male-dominated fields. When we're standing up for our values. When we're doing valuable work and people reduce us to our appearance." We women persist. Isn't that our job? Throughout history, we have persisted in our quest for respect, for justice, for equal rights, for suffrage, for education, for enfranchisement, for recognition, for making our voices heard. In the face of violence, of opposition, of ridicule, of belittlement, even of jail time, nevertheless, we have persisted. In March 2017, Chelsea Clinton announced she had written a picture book for children about 13 inspirational American women, titled She Persisted. Clinton's book was adapted into a musical by playwright Adam Tobin and composer Deborah Wicks La Puma that premiered at Bay Area Children's Theatre in February 2019. The second-season finale of Supergirl is titled "Nevertheless, She Persisted." In the Agents of S.H.I.E.L.D. season 4 episode "No Regrets", Leo Fitz reported that a woman was being tortured but had stayed true to her cause, saying "Beaten within an inch of her life … nevertheless, she persisted." In July 2017, independent Abraham Lincoln researcher Kerry Ellard published an article entitled "Nevertheless, She Persisted" about Mary Todd Lincoln's fight for a government pension during the last two years of her life. The anthology Nevertheless, She Persisted, was released by Book View Café in August 2017. The anthology contains stories of female empowerment. The comic Doonesbury for Sunday, March 3, 2019 makes a reference to this incident. ^ a b c "Congressional Record — Senate" (PDF). Congress.gov. February 7, 2017. p. S853. Retrieved April 10, 2017. ^ Kane, Paul; O'Keefe, Ed (2017-02-08). "Republicans vote to rebuke Elizabeth Warren, saying she impugned Sessions's character". The Washington Post. Retrieved December 17, 2017. ^ Hawkins, Derek (February 8, 2017). "The silencing of Elizabeth Warren and an old Senate rule prompted by a fistfight". The Washington Post. Retrieved December 17, 2017. ^ a b c d e Garber, Megan (8 February 2017). "'Nevertheless, She Persisted' and the Age of the Weaponized Meme". The Atlantic. Retrieved 22 March 2017. ^ a b c d e Victor, Daniel (2017-02-08). "'Nevertheless, She Persisted': How Senate's Silencing of Warren Became a Meme". The New York Times. ISSN 0362-4331. Retrieved 22 March 2017. ^ a b "Congressional Record — Senate" (PDF). Congress.gov. February 7, 2017. p. S853. Retrieved April 10, 2017. The PRESIDING OFFICER. The Chair has not made a ruling with respect to the Senator's comments. The Senator is following process and tradition by reminding the Senator from Massachusetts of the rule and to which it applies. Ms. WARREN. I am asking what this rule means in this context. So can I continue with Coretta Scott King's letter? The PRESIDING OFFICER. The Senator may continue. ^ a b Shapiro, Rebecca (8 February 2017). "Democrat Defies GOP, Reads Part Of Coretta Scott King's Letter On Senate Floor". Huffington Post. Retrieved 24 March 2017. ^ a b "'Nevertheless, She Persisted' Goes Viral After Warren Rebuke". NBC4 Washington. 8 February 2017. Retrieved 22 March 2017. ^ a b Campuzano, Eder (7 February 2017). "Jeff Merkley reads Coretta Scott King's letter about Jeff Sessions on Senate floor (video)". OregonLive.com, The Oregonian. Retrieved 24 March 2017. ^ "Congressional Record — Senate" (PDF). Congress.gov. February 7, 2017. p. S855. Retrieved April 10, 2017. The PRESIDING OFFICER. 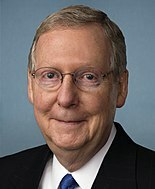 The Senate majority leader. Mr. MCCONNELL. Here is what transpired. Senator WARREN was giving a lengthy speech. She had appeared to violate the rule. She was warned. She was given an explanation. Nevertheless, she persisted. I yield the floor. ^ Bruce, Mary. "Silencing the Senator - GOP Rebukes Warren: Speech Goes Viral". World News Tonight with David Muir. ABC World News. February 8, 2017. "Tonight, that language now a rallying cry for the opposition." ^ a b Park, Madison (8 February 2017). "#LetLizSpeak: 'She persisted' becomes rallying cry". CNN. Retrieved 22 March 2017. ^ "People Are Using "Nevertheless, She Persisted" To Share Examples Of Badass Women". BuzzFeed. 8 February 2017. Retrieved 22 March 2017. ^ Wang, Amy (8 February 2017). "'Nevertheless, she persisted' becomes new battle cry after McConnell silences Elizabeth Warren". Washington Post. Archived from the original on 2017-02-08. Retrieved 22 March 2017. ^ Detrow, Scott (8 February 2017). "GOP Blocks Sen. Elizabeth Warren From Jeff Sessions Debate". All Things Considered. National Public Radio. Archived from the original on 2017-02-09. Retrieved 2017-05-04. ^ Woolf, Nicky (20 October 2016). "'Nasty woman': Trump attacks Clinton during final debate". The Guardian. 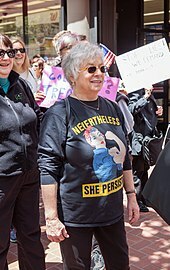 ^ "Boston-based Reebok releases 'nevertheless, she persisted' shirts in support of Elizabeth Warren". The Week. 10 February 2017. Retrieved 22 March 2017. ^ Leah, Rachel (23 February 2017). "More than 100 women get "Nevertheless, she persisted" tattoos in Minneapolis". Salon. Retrieved 22 March 2017. ^ Riley, Taylor M. (9 March 2017). "Women are getting Mitch McConnell tattoos. Wait, what?". USA TODAY. Retrieved 23 March 2017. ^ Frizell, Sam (22 May 2017). "How Elizabeth Warren Turned a Tattoo Into a Governing Principle". Time. ^ Herb, Jeremy (June 7, 2017). "Senators try to quiet Harris, but she doesn't back down". CNN. Retrieved June 7, 2017. ^ Allen, Charlotte (14 February 2017). "The Marketing of Elizabeth Warren". The Weekly Standard. Retrieved 28 March 2017. ^ Harsanyi, David (10 February 2017). "Elizabeth Warren for President". National Review. Retrieved 28 March 2017. ^ a b Desanctis, Alexandra (9 February 2017). "No, Elizabeth Warren Doesn't Belong in the Same Breath as Harriet Tubman and Rosa Parks". National Review. Retrieved 28 March 2017. ^ Kauffman, Gretel (8 February 2017). "Why did Senator Warren get silenced during the Jeff Sessions hearing?". Christian Science Monitor. ISSN 0882-7729. Retrieved 28 March 2017. ^ Stevens, Heidi (8 February 2017). "In silencing Sen. Warren, a new feminist rally cry born: 'Nevertheless, she persisted'". Chicago Tribune. chicagotribune.com. Retrieved 22 March 2017. ^ a b Schultz, Valerie (29 March 2017). "From the Gospels to Elizabeth Warren, women nevertheless persist". America: The Jesuit Review of Faith & Culture. Retrieved 31 March 2017. ^ Aridi, Sara (March 16, 2017). "Chelsea Clinton to Publish Children's Book, She Persisted". The New York Times. ISSN 0362-4331. Retrieved March 22, 2017. ^ McMullen, Randy (February 4, 2019). "'She Persisted' rallying cry becomes a kids musical touring SF Bay Area". The Mercury News. Retrieved February 4, 2019. ^ Zack, Jessica (January 28, 2019). "Chelsea Clinton's 'She Persisted' turned into a musical at BACT". San Francisco Chronicle. Retrieved February 4, 2019. ^ Abrams, Natalie (May 1, 2017). "Supergirl finale title revealed". Entertainment Weekly. Retrieved May 1, 2017. ^ Lachenal, Jessica (April 19, 2017). "Agents of S.H.I.E.L.D. Debrief Season 4, Episode 18: "No Regrets"". The Mary Sue. Retrieved 2019-04-11. ^ Ellard, Kerry. "Nevertheless, She Persisted". LincolnAbraham.com. Archived from the original on 2017-08-05. Retrieved August 5, 2017. ^ "Nevertheless, She Persisted". Book View Cafe. August 2017. Retrieved September 24, 2018. ^ Trudeau, Garry (2019-03-03). "Doonesbury by Garry Trudeau for March 03, 2019 | GoComics.com". GoComics. Retrieved 2019-03-03. Wikimedia Commons has media related to Nevertheless, she persisted.